Sa Calobra or the Torrent de Pareis is a small natural cove located at 7.5 nautical miles to the north from Port of Sóller in the Sierra de Tramontana. The cove consists in the mouth that forms the Torrent de Pareis whose final part is a natural canyon with walls over than 200 meters high, and a base formed with boulders and an opening to the sea of about 20 meters wide, where we can find a pebbled beach. Over time, the torrent has been building this spectacular formation, which is undoubtedly one of the most spectacular landscapes in Mallorca. The last part of the Torrent de Pareis forms a natural open-air auditorium that once a year is used for this purpose, celebrating “Sa Calobra Concert”. For all these reasons in 2003 the Torrent de Pareis was declared Natural Monument and Humanity Heritage by the “Govern Balear”. A small tunnel dug into the rock of one of the cliffs connects the cove with a small village where you can find some great places to eat or to buy a souvenir. 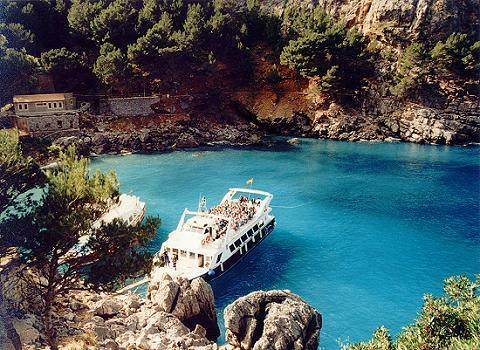 Come on board with us and discover Sa Calobra with Barcos Azules! Check here schedules and prices.